Alterna is proud to announce the upcoming release of CORKTOWN, a brand new three issue horror series coming in the spring of 2016 from Mario Candelaria (ASHES, ÉPILOGUE), Scott Ewen (THE SUNDAYS, LIGHTSHADE, FLIGHT OF THE LIVING DEAD), and David Ganjamie (ÉPILOGUE). "I've always wondered what happened when vampires died,” says writer Candelaria. “Their bodies are still animated, but they are always referred to as 'being dead' and that inspired Scott and I to tell this story. I am glad that Alterna gave Scott, Dave, and I an outlet that allows us to tell it our way." 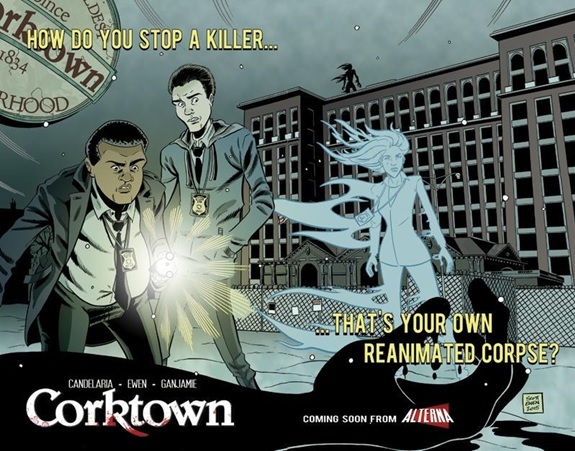 A fresh take on ghosts and vampires, CORKTOWN is a part of Alterna’s 10th Anniversary celebration kicking off in 2016. Look out for more announcements in the coming months.